There's a new thing to join; BYOB - Featured Bread Blog. I like the idea of meeting another baker and digging in her or his recipes. This way I can be inspired and learn from them. BYOB chooses the baker and I choose the recipe. There’s so much Cathy has baked over the years it’s hard to choose a recipe. I wanted to bake with my sourdough starter which made my choice easier. Next steps I took, was looking at titles, ingredients and photos. I try not to judge the bread by the cover (photo) but…. Again it’s difficult because there’re a lot of good looking loaves to choose from. Then I just choose the ingredients I wanted to taste in my bread the next morning for breakfast. This one came out: Seed Bread from Jeffrey Hamelman’s book BREAD. The other thing I noticed; Cathy takes a lot of pictures during the process of baking bread. I remembered when I was new at baking my own bread this helped me a lot. And, still I like to look at all those photos. Thank you Cathy for sharing so many recipes and photos, and let’s not forget to thank Jeffrey Hamelman. We enjoyed our Sourdough Seed Bread very much. When you taste and smell this bread you want to make it too! Cathy used less sunflower seeds and added a bit more sesame seeds. I used the same amount as Jeffrey Hamelman in his book. Liquid Levain: the evening before (12 to 16 hours) I mixed the ingredients for the liquid levain. I left it in a plastic container with a lid for the night in my kitchen. It’s probably warmer than the adviced 21°C in our house because the next morning after about 10 hours the levain looked like it was fully fed and ready to drop. Flaxseed Soaker: after the levain I poured 20 grams of flax seed in a plastic container filled with 190 grams of water and closed the lid. I choose to use 20 grams for soaking and the remaining 42 grams I grinded for the final dough the next morning. Baking day: first I roasted the sunflower kernels, sesame seeds and some wheat germs until golden. When the seed cooled off I was ready for the final dough. The final dough: I added all of the ingredients, except salt and the seeds, in the mixing bowl of a spiral mixer and mixed until all was well combined. In the mean time we had breakfast. After 30 – 60 minutes I added salt and the seeds. The flaxseeds float in a kind of gelatin water, that’s normal. I mixed on first speed for 3 minutes and on second speed for another 3 minutes or so. The dough should have moderate gluten development. Shaping: I divided it into two pieces and loosely pre shaped into balls. Covered with a towel and left for 15 minutes to rest. I choose to make one round and one batard shaped loaf. I shaped them firmly but gently. Transfered them in the floured bannetons, covered with a moist towel and place them in a plastic bag. Proofing: I proofed the loaves for 1,5 hours. Because of the warm/hot temperature in our house I watch them to prevent over proofing. I place the loaves on parchment on a peel and score them as quick as I can. Transfer them to the oven and quickly slide the loaves on the baking stone. After some minutes I add some more water to get more steam. Thank you Heather, I'm happy with these loaves too and they taste so great. Good choice to pick Cathy for our first BYOB - featured bread blogs! I still have not gotten into sourdough breads and always admire those who do. Your loaves are just perfect, great job! Ones you started with sourdough you don't want to stop. Even when I'm not actually baking a bread I'm still feeding my sourdough and I love it. That's a beautiful loaf! I really love using seeds for making bread, especially sesame seeds, they give that lovely delicious aroma! I have a recipe bookmarked from Cathy's to try, hopefully I'll be able to make it on time! Thank you Joyce, we also hope you are on time to join us with a recipe of Cathy at BYOB. I also love to work in my garden and I enjoyed your "Little Potted Garden". I've always been delighted with seeds in my loaves. This is really an exceptional looking loaf. You make it sound like a gem. Gorgeous photo that 2nd one! Thank you Tanna, what kind words for these loaves. 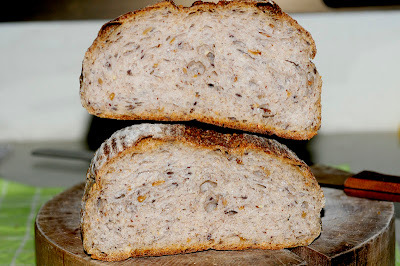 I love seeds in my bread too, especially sunflower kernels, sesame, flax, poppy. Next time I'll try Thai holy basil seed, because when soaked in water the seeds become gelatinous. Hi Connie, this loaf is really my kind of loaf - with healthier ingredients such as rye flour and seeds. I do enjoy a sourdough loaf and look forward to trying to make one soon. Thanks for the photos, it helps to see the process. we also love healthy bread. Good luck with baking this and using sourdough. I hope to see your bread too. Hi Connie, read about you and was surprised your thoughts are so similar to mine. I'm living life rather close to your description [so beautifully expressed], which means I'm in the right track of mind. We share the same passion, making most things on our own. My hubby can have bread 3 meals a day. Hi Kimmy, good to see there are many more people who like another way of living. Peter also could eat bread whole day. But, Thai food is so delicious we love to alternate them.